Starting with the impressive front facade with half round windows, arched brick entry and quoin corners, and finishing with an interior fit for a king, one is sure to receive many compliments on this home. 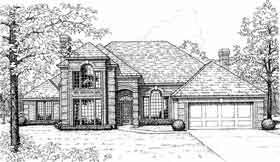 The living room with a brick fireplace and an open formal dining room welcomes you inside. A family room with a bar, entertainment center, brick fireplace, and breakfast area is just steps away. An open kitchen with island range and a huge pantry makes preparing meals a breeze. Retire to the master suite with luxurious private bath and two walk-in closets. Upstairs you'll find two large bedrooms and a convenient recreation room. There is also another bedroom downstairs that could double as a study.